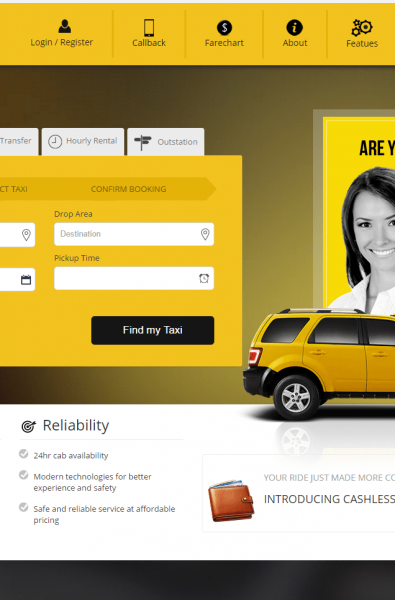 Salo Taxi presents awesome online software for taxi cab booking system and mobile Application to Book Online Vehicle Facilities. Built on PHP with Codeigniter Framework. Its customer-friendly website and App built for fast, efficient, effective, responsive way to access all the cab facilities on your fingertips. It has all the details, information of the cab, the cab driver and the owner of the cab so the customers feel secure in their travel and they can track the vehicle and driver easily with the help of the software. The customers have their own way of access to the website as it’s a responsive website which is readily and easily available and supported on every device. One of the uniqueness of this type of service is that the customers can pay online instead of paying for travel. The Business can track the vehicle payment details and they will get updated every time once the trip gets over. Now, booking online cabs through our well-designed and optimally performing Salo Taxi App has become a simple possibility. Our prime target and focus lines in capturing the mobile application market that will make reserving taxis an uncomplicated procedure. Salo Taxi Dispatch is an internet based ( Automatic or Manual ) taxi dispatch system for those taxi and minicab companies who want to introduce a dispatch system and move away from pen and paper “systems” or radio dispatch. It is also for those who have tried other dispatch systems but have found them to be hard to use and complicated to set up. If you can switch on a computer and use a mouse then this is the system for you. All the basics required in a dispatch system are available in one package. Pricing is simple. Taxi dispatch system in the cloud! We offer the most cost effective taxi dispatch system on the market. Dispatch jobs, manage your fleet, online booking website and mobile booking apps for Drivers & clients. Looking for a Car Rental app ?